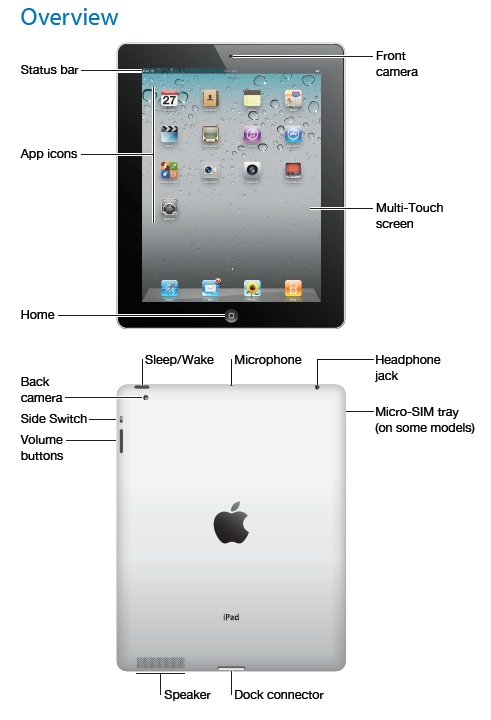 Apple, Inc. has posted the iPad2 User Guide for iOS 4.3 software. This 198 Page guide is a 16MB download. Everything from an overview of the iPad2 to a review of the included applications is covered. There are even some tips on troubleshooting. If you want to read and use the PDF guide on your iPad, open this post in the safari browser on your iPad and click on this link. After the PDF loads, at the top right of your browser, you will have an option to open your PDF in a different app. 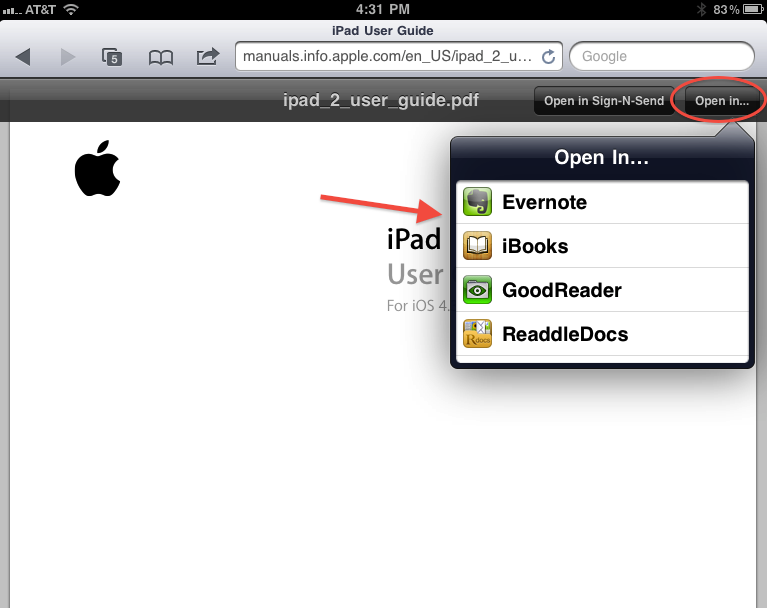 Tap on “Open in…” Choose the app you want to use to open the PDF. If you do not have any paid apps like GoodReader or ReadleDocs, you can open it in iBooks. Then, you can have the manual available on your iPad whenever you want. I’m an new owner of a Ipad2 also i have had a Macbook Pro for a couple years. I am familiar with Pages. Just got the iPad 2 and need instructions on how to use my iPad. My ipad has Pages and also Numbers on it. What kind of user manuals or instructions can you help me with? Apple has a good support site for its iOS apps. There is online help for Pages and Numbers. These sites should be a good start. Hope that helps. How can you make a product and not include a user manual? There are some prople out here that need the support without the hassle of looking for it on line. I am right there with you Doris. I cannot believe there was no manual with my new Ipad2 and all I do is look for help online. Very disappointing! My mother has been given an iPad to stay in touch with her family. She has no computer. How can she get the manual? I feel the same way about the lack of a user manual. Its as though Apple beklieve they are “special” and only the elite would know how to use the ipad. 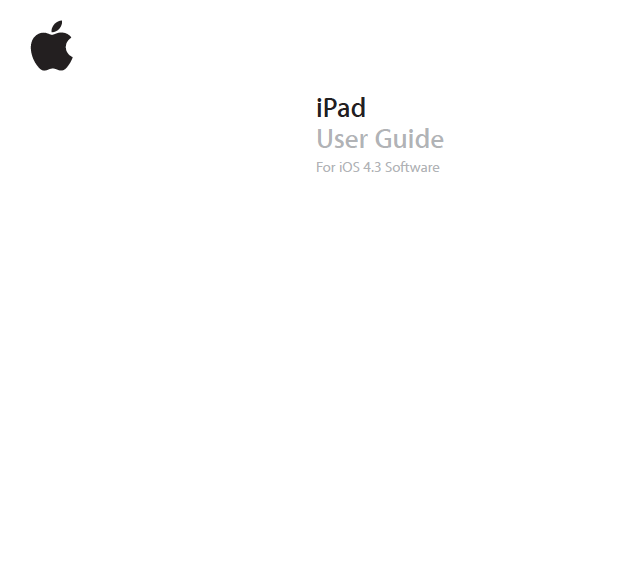 I want to read the iPad2 user manual offline. How do I download it to iBooks? On your iPad, click on this link. Your safari browser should open and the manual will be downloaded to your iPad. It will appear in the browser. Tap the manual and at the top right, you should see “Open In…” or something similar appear. Tap “Open In…” You should be provided with an opportunity to select the app you want the manual to open in. iBooks may be one of the choices along with other apps that can open a PDF. Perfect, simple explanation. Thank you, Justin. I am also having trouble installing I cloud. what can i do?ipad locked up wont read itunes from my computer/possible software glitch!! “Ipad2 – the missing manual”. It’s printed by O’Reilly. I have one and it’s the best book you can get. It’s got everything. Go get one !!!!! How do you connect a wireless printer to a I Pad 2 ? There are several variable including the printer you have, the wireless network you have and whether the app you are using allows you to print. Look through the Apple support page and see if your question is answered. I wish to purchase a manual for the Apple IPad which I purchased recently. Please help. Apple iPad manuals are available here.